In August Deaf Dogs Rock sponsored 13 deaf dogs/puppies through our Rocker Puppy sponsorship program. Our core mission of our Deaf Dogs Rock Rocker Puppy program is to set up each deaf puppy/dog for success by sending them into a experienced special needs rescue where they go into a experienced deaf dog foster home that is committed to training and socializing each deaf dog that comes into their care. This way each foster advocate gets the opportunity to live with the deaf dog, work with the deaf dog and accurately evaluate each deaf dog/puppy to make sure to match the dog with the right home once the adoption screening process starts. The adoption screening process is very thorough. Each interested family must fill out an adoption application that asks lots of questions and a full list of references is required to be considered for adoption. Jan – July 2018 Deaf Dogs Rock has sponsored a total of 80 deaf dogs and puppies into rescue. With our numbers in August being 11 deaf dog/puppy sponsorships that brings our total Rocker Puppy rescue sponsorships for the year up to 91 deaf pups who were sponsored into the safe harbor of rescue. Thanks to Speak For The Unspoken in Grove City Ohio for stepping up and getting Huey to safety. We appreciate all your efforts and are so glad Huey is safe and found. Thanks to Speak for The Unspoken St. Louis deaf puppies Bismark and Jade are in the safe harbor of their rescue. Bismark is a beautiful deaf border collie mix puppy who is 8-10 weeks old and doing well in rescue. Jade is a 23 pound petite girl who is about 6 months old and was given away in a Walmart parking lot to a 15 year old girl who took her in and got her to Speak St. Louis. Sometimes good people step up to rescue a deaf puppy with the intention of contacting a rescue so the puppy will be safe and not end up in a bad place. Speak St. Louis and Speak Ohio are always there in the Midwest to rescue and advocate for deaf puppies who need help. 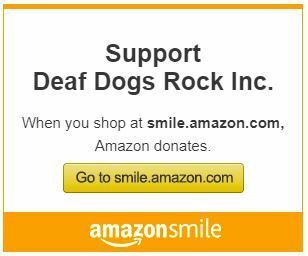 Thanks to our Deaf Dogs Rock supporters we can step up and sponsor each deaf puppy through our Deaf Dogs Rock Rocker Puppy program so they can be vetted and so the rescues can continue to afford to help more deaf dogs and puppies. We received several emails for Thomas the three year old deaf boxer from BARCs in Houston TX. Thomas was also Heart-worm positive (high positive) and needed rescue and HW treatment. Everyone on social media rallied on behalf of Thomas and he had a lot of pledges to cover his Heartworm treatment so we were so excited when Hot Mess Pooches stepped up to pull Thomas to safety. Look at his freedom photo and his silly goober head! A big shout out to Natalie and Hot Mess Pooches for helping Thomas. Now he has to start on his HW treatment and his road to recovery. When we learned Bueller the deaf/blind puppy who was dumped at only two weeks old was having a bit of bad luck we knew we had to help. When Bueller’s foster mom took him to the vet it was discovered little Bueller was diagnosed with Strangles. He has swollen lymph nodes and he had to be treated medically right away. Deaf Dogs Rock sent Speak For The Unspoken (Ohio), a $250 Rocker Puppy sponsorship to go directly to his medical needs so he can beat his Puppy Strangles. 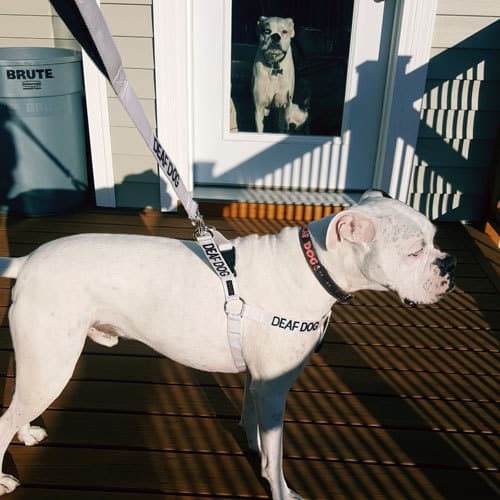 When we received Calvin’s adoption listing we reached out to the listing person to see if they would let us work with them and sponsor Calvin into the Deaf Dogs of Oregon Rescue. Not only was his caregiver excited Calvin was going to the Deaf Dogs of Oregon Rescue, but he also had several qualified families interested in adopting him so he was adopted in a very short time. Thanks to Red Hook Dog Rescue for pulling deaf girl Polina from the NYC ACC to get her into the safe harbor of rescue. Deaf Dogs Rock sent in her sponsorship to help with her vetting costs. She is getting over kennel cough right now while they get her settled and get to know her better before she becomes available for adoption. Photo above: Polina’s Freedom Ride! These two deaf pups were at a shelter that reached out to Green Dogs Unleashed to see if they could help. Izzy and Avery are now with Green Dogs Unleashed and both are in foster care to learn new things. Izzy and Avery are both recipients of our Deaf Dogs Rock Rocker Puppy Program so they can get what they need in foster care to learn how to be a normal dog who lives inside with a family. Fluff is a 11 week old deaf puppy who was surrendered as an urgent medical case to Speak St. Louis. From Judy with Speak St. Louis: Fluff was having vestibular events. He’s had an MRI and spinal tap which revealed inflammation of the CNS. We have no answers yet unfortunately. He is doing well right now and I am making an appointment for a recheck and will at that time schedule his neuter. Deaf Dogs Rock will sponsor Fluff under our Rocker Puppy Program to help pay for some of Fluff’s medical needs. A big shout out and thanks goes to the Speak St. Louis team for taking some of the hard medical cases when it comes to saving deaf puppies. Nash has come to Speak St. Louis because his family did not have the time or space for a special needs puppy. Speak St. Louis took Nash in where he is learning all kinds of new things to prepare him for his new life when he gets adopted. Nash is also one of our Deaf Dogs Rock Rocker Puppy recipients thanks to our amazing Deaf Dogs Rock community for holding birthday fundraisers on Facebook and donating to our cause to help one deaf dog at a time.